Optimal, oral health is our goal for all patients. The goal of what is considered optimal is derived from active conversation and communication with our patients as to what their personal goals are for oral health, along with our professional evaluation. We provide preventative, comprehensive oral health care for children. It’s important to provide children with education on oral health and diet at a young age. Here at Mocksville Family Dentistry, we take pride in the family in our name. Here at Mocksville Family Dentistry, we take pride in the family in our name. We make every effort to keep the entire family with the same dentist. Annual exams, cleanings, sleep apnea appliances, and more. Invisalign, crowns, veneers, whitening, and more. Tooth-colored fillings, partials, dentures, and more. Preventative oral health care, habit development, and general dentistry. Are you looking for a Mocksville Dentist? Mocksville Family Dentistry delivers the best quality of dental care in a compassionate, considerate, and respectful manner. Our team takes pride in using techniques proven through research and clinical applications, along with the highest quality products available to maintain your dental health. Mocksville Family Dentistry offers predictable dental care. You know each visit you will receive the same high quality level of care. Through ongoing communication and education, our team will provide you with options for treatment so that you can make the best choice for your overall oral health and lifestyle. You don’t have to drive to Winston Salem or Clemmons for your dentist appointments anymore. We saw a need for a new, fresh, modern, dental practice in Davie County and we filled it! 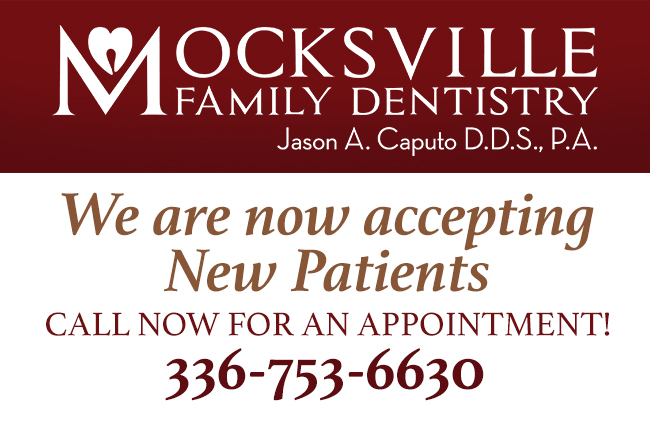 Mocksville Family Dentistry brings over 12 years experience to Davie County. We are in-network providers for: Aetna, MetLife, Delta Dental and Sun Life Financial. The goal for your first visit is for you to have the most thorough, but comfortable, dental exam ever. The purpose of this evaluation is to develop a treatment plan to help you achieve and maintain your optimal oral health. Optimal, oral health is our goal for all patients. The goal of what is considered optimal is derived from active conversation and communication with our patients as to what their personal goals are for oral health, along with our professional evaluation. We understand that varies from patient to patient, and we understand that not all patients want that “Hollywood smile.” We will work with you to develop the best plan for YOU! We know it’s important for us, as your dental care providers, to be on the same page as you, the patient. We like to build relationships with our patients so that we always know what their wants and needs are. And we have open conversations with patients, to explain the need for specific treatments and treatment options in certain situations. During your first visit we will go through a comprehensive check-up and will learn more about your standards for optimal, oral health. I see where you have a new practice! I told my Mother in law, Francis, about it and she wanted me to ask you.. if we get a bus load of folks for you, can you still be our dentist???!!! We miss you and are glad you are doing well! Congratulations! You are such a nice guy and really make your patients feel like family... You are always so nice to me and it makes me dread coming to the dentist a little less. I think you are a great dentist and person. I tell patients all day long that you are a wonderful dentist. I want you back (in New Bern) with us...when you left, I lost a lot...I love Dr. Caputo. Haven’t been to the dentist since you left (New Bern). Pencil me in at your new office. I want to be your first patient! Well worth the drive. You’re the first dentist that has ever been able to work on me without hurting me.